Guys... How to add description to the hero speciality? I know that to do so i need to use the.. Personally, I am dying to get the script which enables Dragon Flies to get back after they strike ( and cast weakness ), just like Harpy Hags do. Do you want a custom description, with pics and so? Because then you have to use ! !CM1 trigger, click on icon. The icon picture is ready... i what only the description. Are you sure about !!CM1? In ERM help it's for town screens. szaman, you reported you had wrong specialty pic, did you solve it? Because I get it also now, on Roland. From the old version of era i have extracted the Un44.def and make it as a mod and that fixed my problem. ok, so the def was not correctly repacked, thanks. Is there a way to make a creature lose its upgrade? 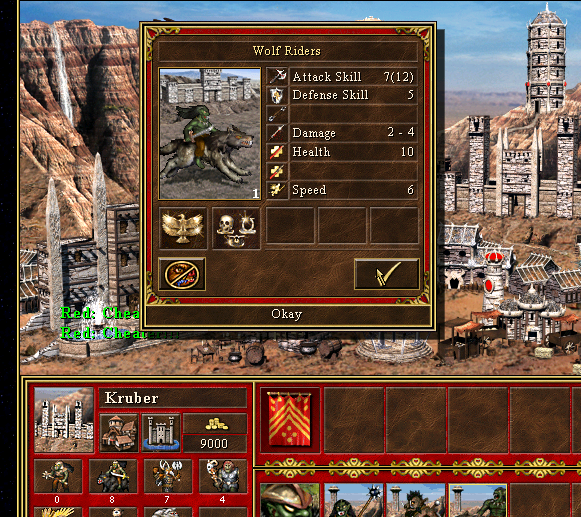 I want to make Wolf Riders have no upgrade at all, meaning that their default upgrade will not work and the upgrade button will be gone. Use the same ID as upgrade? That wouldn't make it an upgraded creature, that would just make the upgrade button useless (you press the button, 0 gold is asked and nothing happens). I was wondering if there's a way to make it work as an upgraded creature even though it's not (and is placed on the non-upgraded slot in Stronghold). ERA_hooker (I still need to learn syntax) or plugin can do it. You also need another one for hill fort, otherwise you get weird stuff happening with cost and upgradability. It has a few side effects for RMG, I think, however (e.g. creatures in Pandora's Boxes). I don't understand, did you make the plugin? If so, can you share it with a download link? I don't really understand how the script works. It's not as portable for sharing as translating into ERM however. Yeah, I was actually asking about it from a more academic point of view to be honest, since I think this knowledge might come in handy for other modders as well (I am not entirely sure if I will use it myself but I really want to give it a try). I am guessing that this can be parametrized in the same way to make any creature upgraded right? In any case, thank you very much for your time! I really appreciate it!